•	This bandage is recommended for post-surgical use and in cases of hip muscle weakness. 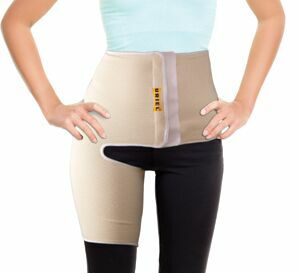 •	The bandage is made of light, elastic cotton material and provides even controllable compression over operative part. •	Helps keeping stitches and pads in place. •	Use the product for the mentioned indication only. •	Do not use the product if you are allergic to one of its ingredients. Material Composition: 50% Cotton, 42% Rubber, 8 Synthetic.